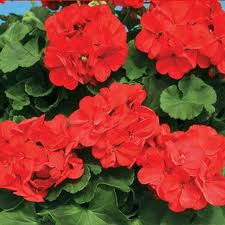 Calliope geraniums are a hybrid variety developed to be more heat tolerant than other varieties of geraniums. While other geraniums typically stop blooming in late spring or very early summer, the calliope will bloom until the fall even in the hottest southern states. It is currently available in two colors, Dark Red and Scarlet Fire. While care requirements of the calliope geranium are similar to those of other varieties, these plants require care for a longer period of time. Place the calliope geranium in a location that receives full morning sunlight and partial shade in the afternoon. 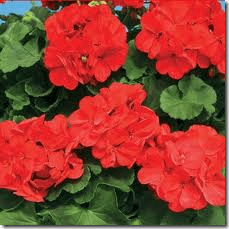 Water the soil under the geranium until it is saturated to the same depth as the root system. If the plant is in a container, water until it runs out of the pot bottom. Allow the top 1 inch of soil to dry out completely before adding additional water. Apply a 20-20-20 liquid fertilizer to the soil around the calliope geranium in the early spring or at the time of planting. Follow the dosage amounts suggested on the bottle and reapply the fertilizer every two weeks until the plants stop blooming in the fall. Alternatively, you can use a 20-20-20 granular, slow-release fertilizer applied every four to six weeks. Examine the calliope geranium on a daily basis for flower blooms that have wilted or begun to turn brown. Grasp the base of the stalk the dead flower is on and break it off using your fingers. Inspect the leaves and stems of the calliope geranium regularly for the presence of tiny insects, which are typically either aphids or thrips. If insects are spotted, spray the geranium with an insecticidal spray until it drips off the leaves, to kill the pests.